Fairy Tales and Dragon Tails | Small, but valuable. Your family might be perfectly normal. You never laugh at (imaginary) people’s pain or when the make-believe dragon eats the make-believe policeman, and I’m very happy for you. It must be nice to be that well-adjusted. But if you aren’t that well-adjusted or if you want a glimpse of my slightly weird family for a few minutes, read on! I grew up with stories about cute bunnies and princesses. Sure. 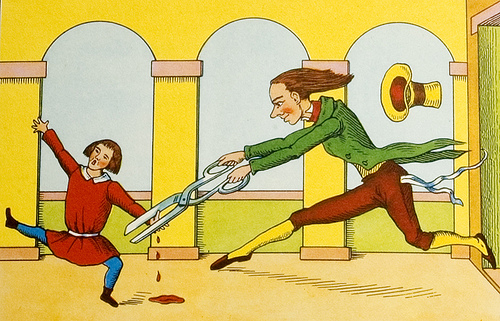 I also grew up with bedtime stories from Der Struwwelpeter. Every story was about someone who had a bad habit. One little boy sucked his thumb, another wouldn’t pay attention to where he was walking, and one was a picky eater. Yeah, that’s about to be a bloody stump in a children’s book and it perfectly represents the end that all bad children met in Der Struwwelpeter. The kid above was the thumb-sucker. He didn’t quite catch on after his first thumb was cut off, so he ended up minus both thumbs. Odd humor also found its way into our family song repertoire. Dead Skunk in the Middle of the Road was a favorite, as well as The Green-eyed Dragon With the 13 Tails. For several years, my parents have tried to remember the last verse to The Green-eyed Dragon without any luck. On Sunday, the internet saved the day and they found the final verse. I got a phone serenade to celebrate the momentous occasion. Nothing like parents who wanted their kids to feel safe in bed at night. This summary doesn’t seem quite fair and balanced. Tis true, I’ll admit, but you aren’t afraid at night. Could we have a few folks weighing in on the nature of your childhood experience? Someone? Anyone? This ain’t no Fox News, lady. I did add a little P.S. for you though. Love you.